One of my favourite things to do is to support other bloggers; it's just a nice thing to do. But as altruistic as it can be it can also help benefit you as well. I've always liked commenting on other bloggers posts because they've taken the time to produce the post and it's nice to give them something back for their effort. Whenever I do leave a comment I always leave my blog link so the post author or other bloggers can take a look at my blog if they want to. I don't check my stats very often but when I do I often see that people have clicked through from other people's blogs through to mine. On a couple of occasions I have also later been contacted by a PR who has seen one of my comments on another blog and has contacted me to offer to send something for me to try. If you do comment on posts though please make sure your comment is genuine and only leave one discrete link to your blog. It makes me angry when I see comments of 'Great post!' followed by a link to every single platform they're on. It's rude and selfish and I would personally delete a comment like this on my own blog. As if all the following/unfollowing isn't bad enough Instagram themselves have made plenty of changes that have made it almost impossible to try and grow if you don't already have a substantial following. Until I decided to work hard on my Instagram last year I tended to scroll through my feed forgetting to even double tap let alone comment on images. I'm now a big time liker and commenter and I really enjoy doing it. I regrammed an image from one of my favourite accounts a few days ago saying they should have many more followers then they have and the blogger was over the moon. As well as supporting other people, and now ensuring that you actually see their images in your feed, commenting on images means your profile is out there and it's much more likely people are going to see it, click on it to have a look and hopefully follow. As well as improving my images I know that commenting on other images played a huge part in the growth I managed to achieve on Instagram last year. I obviously follow a lot of bloggers on Twitter and so when scrolling through my feed I see a lot of links to blog posts and other social accounts. Here and there I like to retweet them, especially if it's a tweet from one of my favourite bloggers or I particularly like an image attached to the tweet. Also if I've read a post that I've really enjoyed or that I think is important I might tweet a link to it myself. Although it never seems to do me a lot of good I know from other bloggers that for them a key factor for growing on Twitter is having an active account that tweets regularly. 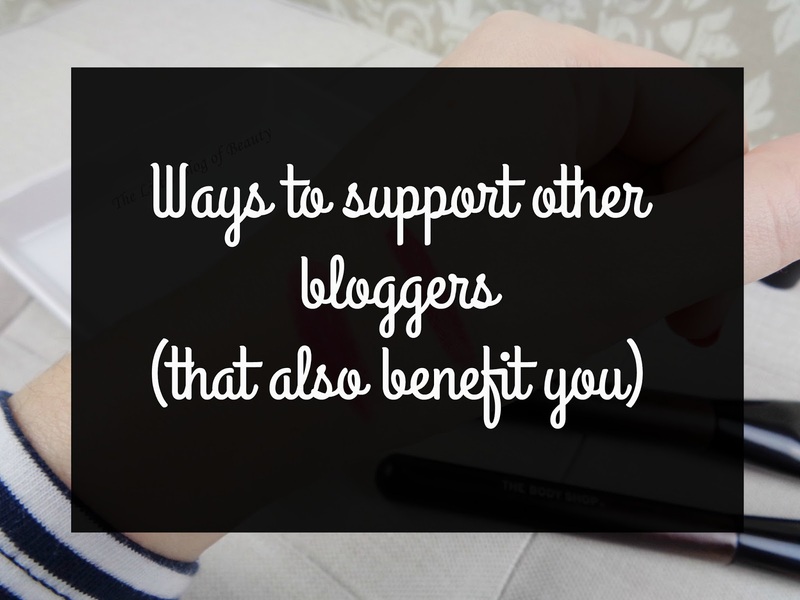 Retweeting other peoples links etc helps keep your account active, getting it noticed, and as it's just generally a nice thing to do people will follow you because they can see you're a kind and supportive blogger. If you're a blogger that receives a lot of PR samples, especially 'surprise' ones you didn't know where being sent to you, then it's likely that you'll regularly build up a collection of products that are not suitable for you (maybe the incorrect shade), that you don't get on with or that you just won't use because you have far too many products. If this is you then why not offer to pass on these products to others. Although you can't really charge for them because you received them for free people are usually happy to cover P&P costs so you aren't out of pocket. If you receive enough samples you probably already have a load of packaging you could recycle to send products on to others. For you this means you're freeing up space and knowing you're not wasting products and for others they are getting nearly new products they want for cheaper that they can then also then blog about if they want to. love this post, I always ensure I comment on a blog post which I read because I know how much I appreciate it when someone comments on mine. I'm also a huge 'double tapper' on Instagram and am trying to get better at leaving comments on there too. some great tips in here which I can take on board! Commenting on instagram posts and blog posts is definitely important. It's the best way of showing support and it's fun having little chats about beauty products.